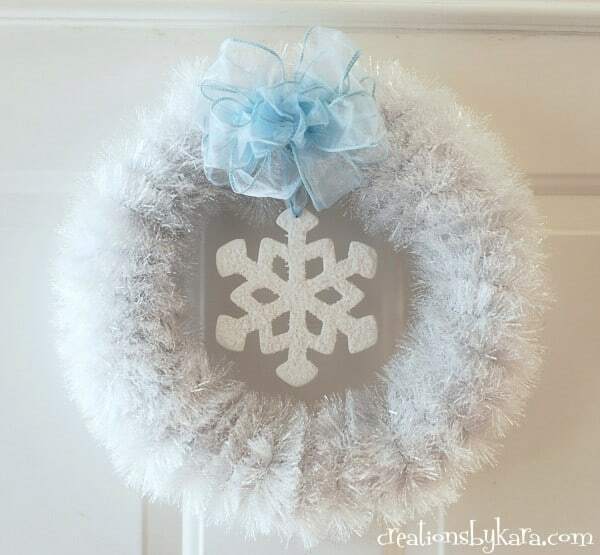 Add a little sparkle to your front door with this White Winter Wreath! It is super simple, but so pretty. After taking down the Christmas tree and decorations, my house always feels a little bare. Which is why most years I leave the decorations up till the middle of January, when I feel like I can start putting up Valentine’s Day decor without too many strange looks. This year though, I thought it might be fun to put up some winter decor. 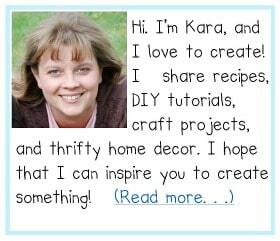 The bright whites and blues are just fresh and clean, and I could definitely use a house that looks more fresh and clean! 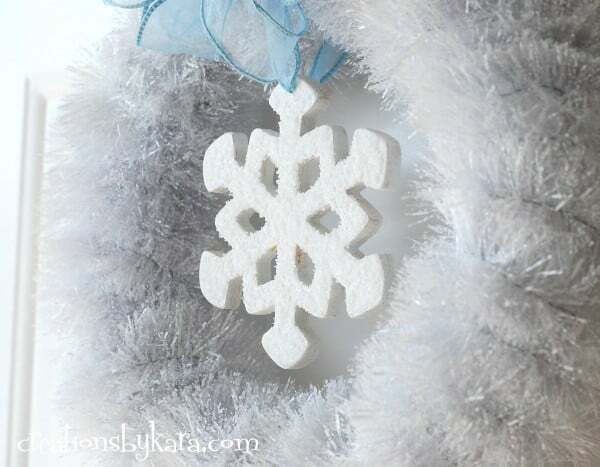 I saw some white glittery tinsel garland in the Christmas clearance section, and it just screamed winter to me. So I brought some home. I pulled out a foam wreath and secured the end of the garland to it with a pin. Then I just wrapped and wrapped till it was completely covered. I used two pieces of garland, securing each end with a pin. Easy peasy. I had some wood snowflakes in my stash from who knows where, so I painted one white. I thought it needed a little more sparkle, but I couldn’t find my white glitter, so I opted for epsom salt. 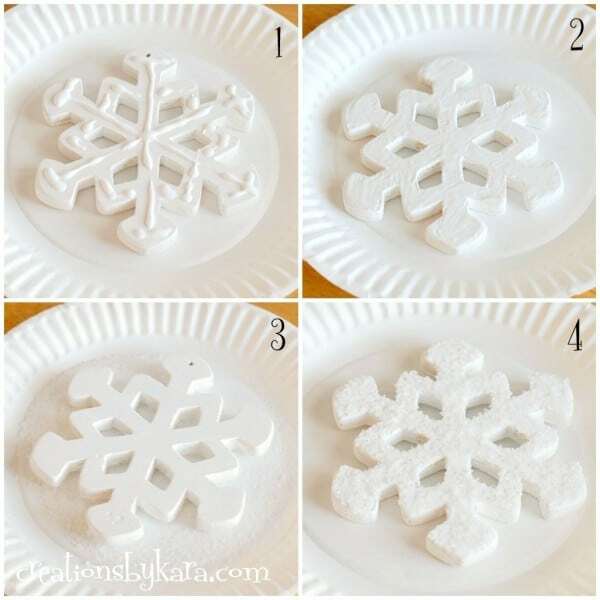 I just added a liberal amount of craft glue, spread it evenly with my finger, dipped the snowflake in a plate of epsom salt, and then let it sit for a few hours till it was totally dry. Update: The epsom salt eventually lost its shimmer, so I recommend using white glitter instead. After that, I hung the snowflake with some ribbon, then added a matching bow on top. Now my front door is all dressed up for winter! I love the sparkly-ness of the epsom salt. So pretty when the sunshine hits it! 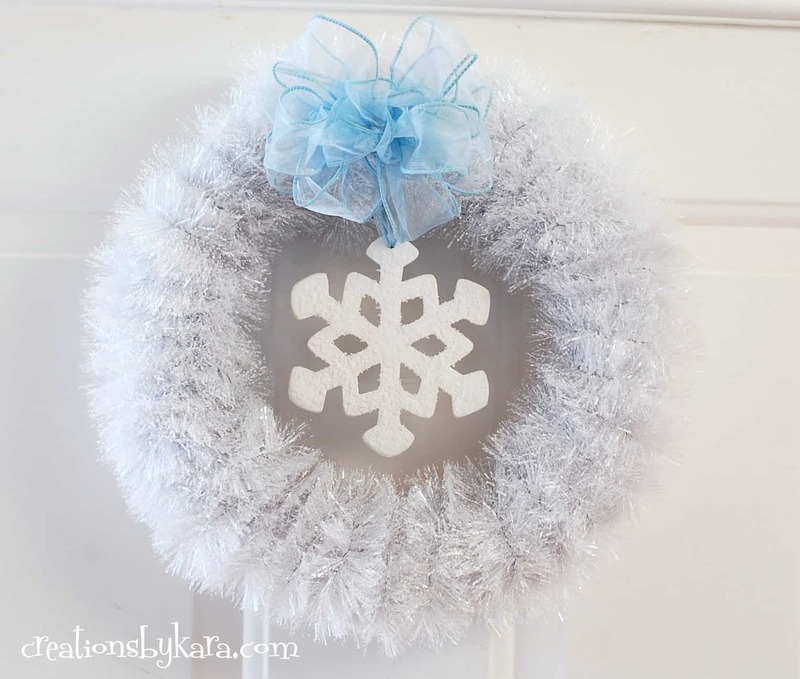 Do you decorate for winter? If you have any great ideas, I’d love to hear ’em. 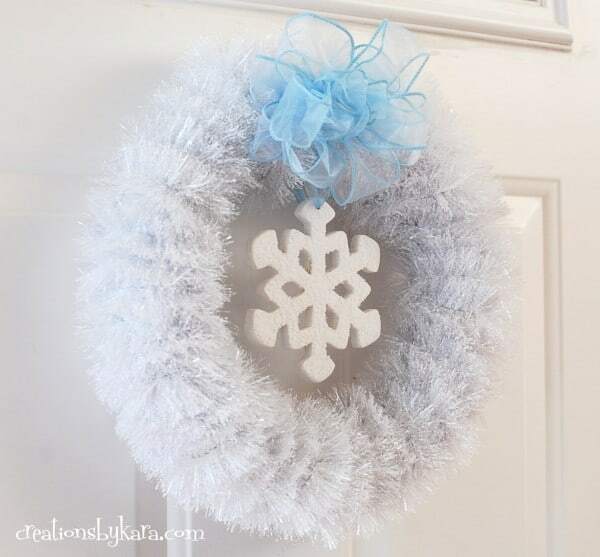 I am loving the material around the wreath! So unique and perfect for winter!